Prepping for 1765 occupied much of my time this past summer. My little one needed a new 1760s gown for my big work event. I needed something that met the 1765 clothing standards but would require a minimal outlay of expenses. The construction is the same as her leading strings and purple striped gowns as I used the Golden Scissors girls gown pattern. I used a woven cotton fabric that cost about $6. If it was silk, it would be perfect for a 1770s project. It's cotton, so it's a stretch for 1765 both in terms of the fabric type and its style. However the scale of the flowers is a nice size for a child's gown, it's machine washable, it was super cheap--and my daughter wouldn't agree to wearing a white gown. As you can see looking at the inside, it's loosely woven making it a little frustrating to work with but doable. While trying to use items from my stash, I up-cycled this green cotton tape. I originally received it on a Pottery Barn package and used it to bind the top of the skirt. The colors match, in a modern sense, and the width of the tape (about two inches) helped keep the loose threads together. ...so I didn't mind making that concession. The back laces closed and the skirts tie closed with white cotton tape. There are two boning channels alongside the eyelets which are boned with reed. The lining fabric is a linen scrap. The day of the event she told me, "Oh Mom, I can't wear that. It won't look very good." I needed to focus my energy on running everything and didn't try to convince her. To meet the clothing standards, I made a bib front apron. I tacked it on so we didn't have to fuss with pins and, of course, it ties around the waist. This photo shows how the bib gaps as I made it a tad too long. 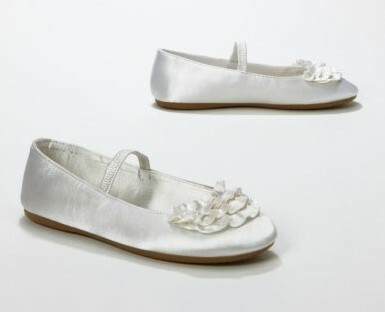 For shoes she wore these polyester satin ballet flats from David's Bridal. I started to remove the ruffles, but my little fashionista protested that I was ruining them. Our pair has two rows of ruffles instead of three. Again it's not a perfect shoe for living history, but it was inexpensive, has a simple design and a rubber sole with a tread. The shoes are currently on clearance at David's Bridal.com. One other detail: I added a feather to her hat as the clothing standards advised. ...and was featured in two newspapers! Historical children's clothing is research interest of mine, though I can't imagine trying to actually get modern child to wear it. :) Your daughter was a good sport and she looked wonderful. Thank you, yes my daughter does enjoy playing along with "history work"! Children's clothing is a lot of fun to learn about, best of luck with your research! Too terribly cute! I love what you did with the inside edge to hide those frays. I need to remember that! What a wonderful outfit! And that curtsey pic - I may die of cute.